Director Martin Scorsese's masterpiece is celebrated on Blu-ray. Martin Scorsese's biography about middleweight boxer Jake "The Raging Bull" La Motta (Robert DeNiro) is a fascinating spectacle of filmmaking as he pulls out all the stops to tell the story of a man who is his own worst enemy. In 1964, Jake is heavyset, rehearsing a nightclub act. 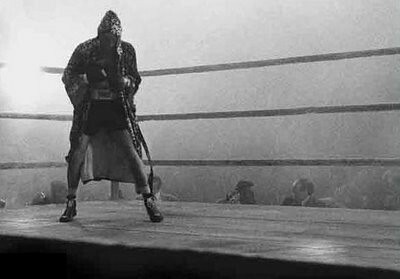 The film then cuts to 1941 where he loses a fight to Jimmy Reeves based on the judges' scores even though he beat Reeves so bad in the final round Reeves couldn't stand up to acknowledge his win. Noticing many in the audience angry at the decision, Jake's manager and brother Joey (Joe Pesci) tells him to stay in the ring. As Jake basks in the adulation, a riot breaks out. Back home in New York, Jake's life is filled with strife, from his unhappy marriage to the mob wanting him to join them. He refuses because he wants to become champ on his own and sees no reason to pay them when he's doing all the work and taking the beatings, but they control who gets a title shot and want to make money off Jake. Jake becomes infatuated with pretty 15-year-old Vicki (Cathy Moriarty) at the local pool and begins a relationship with her while still married. They eventually tie the knot but Jake is constantly distrustful of her, obsessed with the idea she is fooling around behind his back with guys in the neighborhood. When she makes an off-the-cuff remark that an upcoming opponent, Tony Janiro, is good looking, Jake empathically makes sure that's no longer the case during the fight. Scorsese's brilliance as a director is on display immediately during the opening scene. As the credits roll, he reveals elements of the story without drawing attention to them. Jake is in the ring alone, draped in his animal print robe before a fight. He paces the ring and throws punches to warm up. The camera is outside the ring shooting through the ropes, which resemble prison bars as if he is in solitary. The music playing underneath is the Intermezzo from Pietro Mascagni's opera Cavalleria rusticana, a tragic tale of infidelity. The film is filled with captivating sequences in and out of the ring. The boxing matches, including the rivalry with Sugar Ray Robinson, are all very compelling. Scorsese plays with every aspect of filmmaking, such as light, sound, speed, and editing, to make them different from one another. The scenes with his brother Joey are the most intense and almost uncomfortable to observe as they yell at each other and frequently come to blows. Although Raging Bull wasn't a hit at the box office, it was recognized by a number of critics and won a few awards, including Oscars for Best Actor (De Niro) and Best Editing (Thelma Schoonmaker). As it has aged, it has grown in esteem. It was voted the best film of the 1980s by a number of groups and frequently ranks high on "Best Film of All-Time" lists, at least by those who know something about film. I would be happy trapped on a desert island with it. The Blu-ray presentation is marvelous. The 1080p/MPEG-4 AVC, displayed at 1.85:1, encoded transfer treats Michael Chapman's exquisite cinematography very well. The shades of black, white, and gray are rich. The brief use of color in the "home movies" has the faded look expected with aged film. The details are sharp and textures are palpable. There's slight film grain seen when smoke fills the arena. The DTS-HD Master Audio 5.1 track demonstrates the great work done by the sound team. The use of animal noises and other effects are more distinct and evocative. The fight audiences and the commotion can be heard in the surrounds. The bass adds a nice punch to the punches and helps fill in the music. The dialogue is as clear as the cast members speak it. Previously released material include three Commentaries: The first features Scorsese and Schoonmaker; the second is a cast and crew commentary that includes Chapman, producers Robert Chartoff and Winkler, musician Robbie Robertson, and actors Theresa Saidana and John Turturro; and the third is called Storytellers with Jake LaMotta and his nephew Jason Lustig and screenwriters Mardik Martin and Paul Schrader. In a rare occurrence, all three are great listens. "Cathy Moriarty on The Tonight Show - March 27, 1981" (SD, 7 min) - An appearance after she received her Oscar nomination. There's an odd bit of editing when she walks out. There's a quick cut and then she's sitting. Band must have played too much music. "Raging Bull - Fight Night" (SD, 82 min) is an excellent four-part doc about the making-of with the film with those responsible. There's some overlap of information with the Commentaries. "The Bronx Bull (SD, 28 min) presents another look at the film with Jake, Schoonmaker, and British film critics. "DeNiro vs. LeMotta" (SD, 4 min) demonstrates the film's authenticity by comparisons to real life. "La Motta Defends Title" (SD, 1 min) is a MovieTone newsreel about Jake defending title against Dauthuille. Also included is the Original Theatrical Trailer (HD, 2 min). Raging Bull is an absolute must-own. If it's not in your library, I question your love of cinema.